“That’s a COLOR, Daddy,” Anni pipes up giggling. 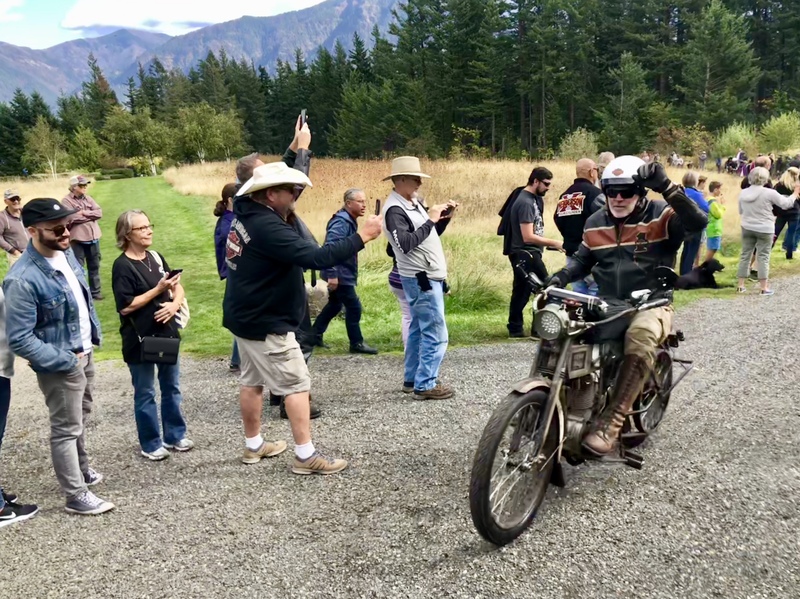 That Finish Line for our 1914 Harley Davidson — the 1st time a single cylinder has won the Motorcycle Cannonball and the oldest Harley on record to cross the United States. Twice. (I’m so proud of Dean and Team Vino!) This was the 4th Cannonball for our team. And it stretched from Portland, Maine to Portland, Oregon. All bikes were pre-1929. Sitting shotgun next to my road weary Cannonball Champion husband, I began mentally cataloguing the wilting contents of my crisper: 3 aging artichokes and some seriously geriatric asparagus. But we have kale growing in the garden. Garlic and shallots in the pig. And literally some 11 pounds of Parmesan Reggiano courtesy of Big Swede’s more recent trip to Europe. Green Pesto need not be limited to basil! Go wild with kale, arugula, parsley, and spinach. These leafy greens make wonderfully versatile pestos that freeze beautifully. Add torn burrata, prosciutto, or not. Extra pepper. Handfuls of thoroughly washed (& *dried) Kale — really any leafy green works beautifully. 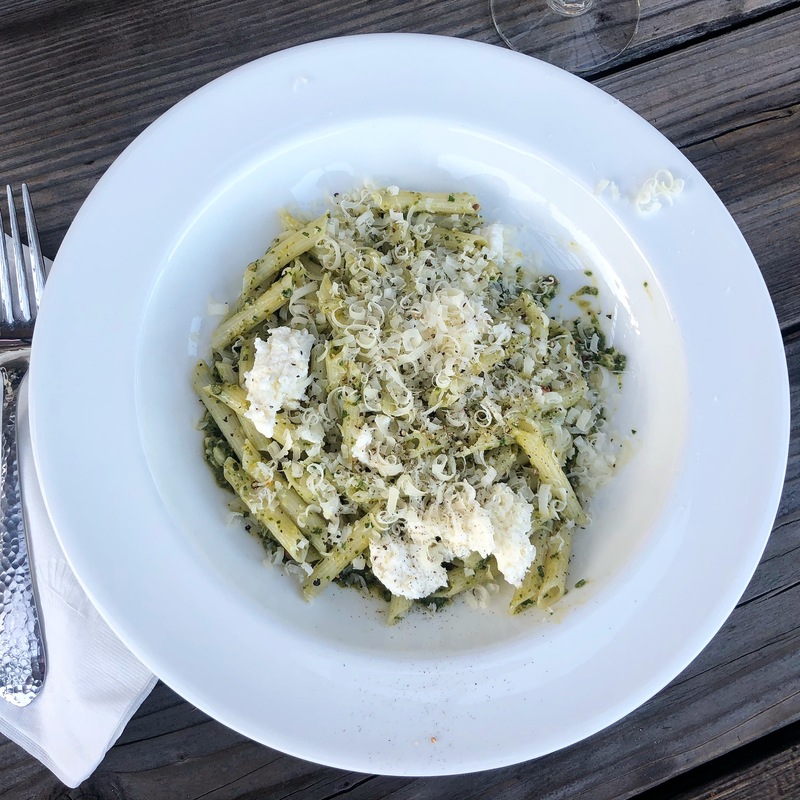 I often make this pesto with the dregs of spinach, basil, arugula, Italian parsley. Individually or all together. Directions: Puree in your food processor to desired consistency. Scrape into a holding bowl and cover with a light film of olive oil. Pesto will brown if not protected from the air. If you’re making ahead? Store in the fridge until ready to use. Note: Make extra Pesto and freeze for later. 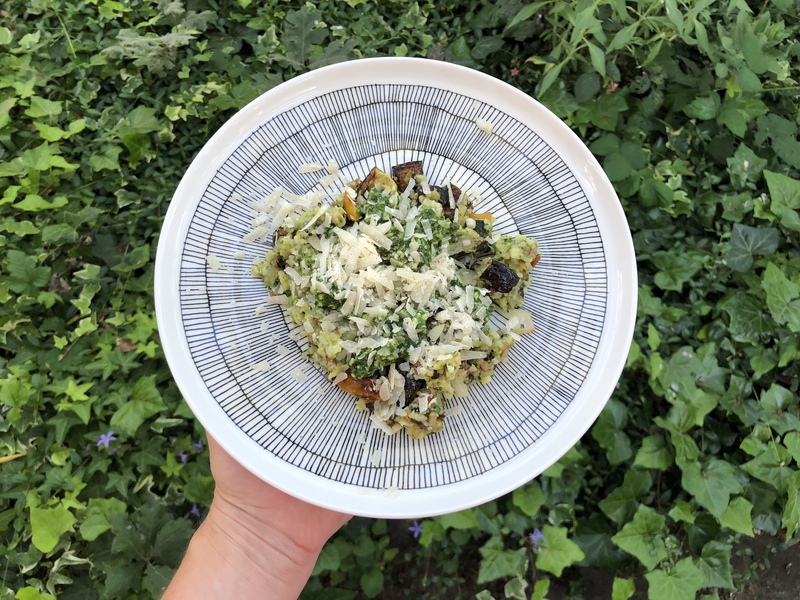 This is a GREAT recipe to “save the season” for a deliciously verdant winter meal that sings of the lushness in Summer produce. Beer well earned! Finish Line, Skamania Lodge, Columbia Gorge, Washington. 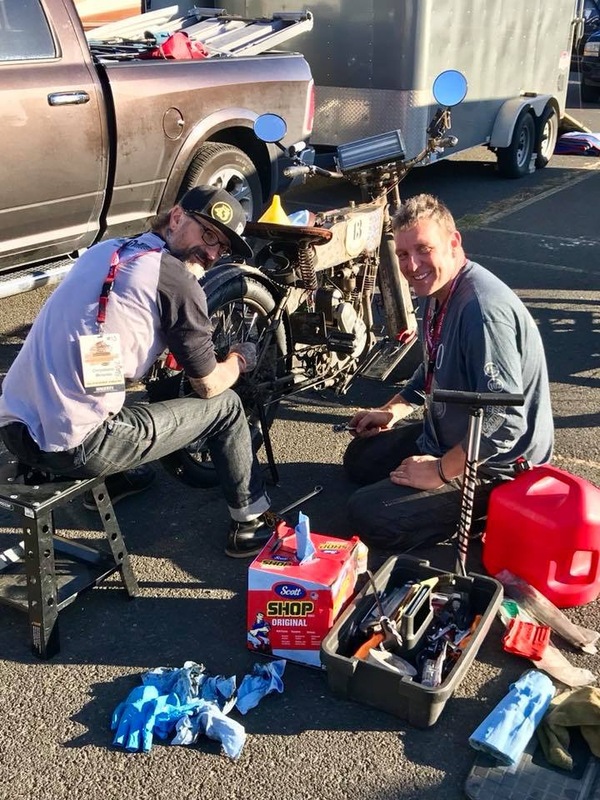 As our 1st week home as a family progressed — and welcomed home teammates and ace wrenches (see below) Chrys Miranda (Garage Metallica, Brazil) and Big Swede (our 6’7″ Swedish neighbor) — Fall made her grand arrival to Wine Country. 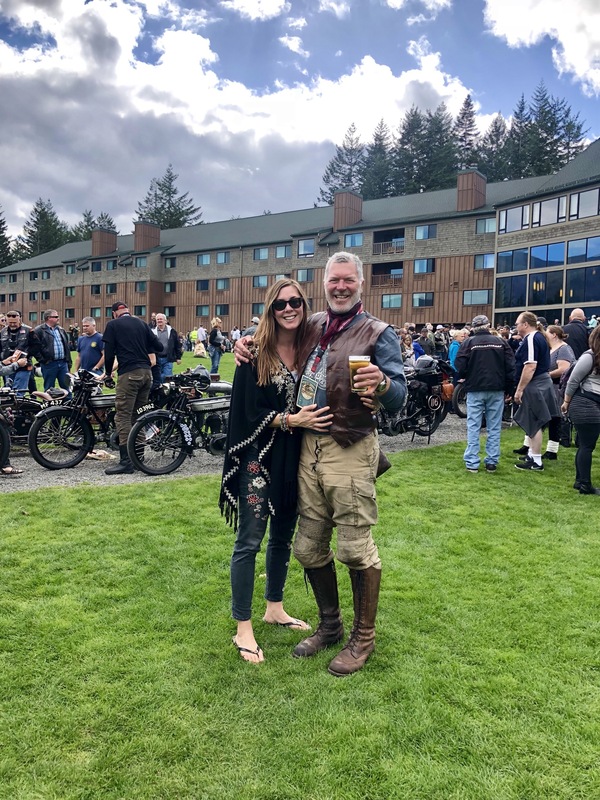 Chris & Big Swede: Last tune-ups before the final stage of the 2018 Motorcycle Cannonball. Cool fog wraps around the house. Tucking into vines still heavy with Cabernet and Merlot, Cab Franc and Petit Verdot. Leaves yellowing in their canopies. Grapes aaaaalmost ready to pick… if the dog would stop eating them! And my menu planning shifts towards red-wine friendly fare. Fall comes suddenly to Sonoma County. One day it’s 92’F and I have ice in my wine. Three days later, the old Japanese Maple begins to flame and I reach unconsciously for cashmere shawls. Extra blankets show up at the foot of each bed. And windows close about 3:00 AM against the increasingly damp, seasonal chill. I love it. I love Sonoma County with a deep resonance. The seasons, the food, the wine, the people, our farm, my Girl Scouts, and family friends. I love it all. To think such carnivorous deliciousness began with a vegan recipe. Never more so than with family back together, a fire in the fireplace, and my no-fuss, delicious risotto baking in the range. Which brings us to dinner #5 post Cannonball: RISOTTO. 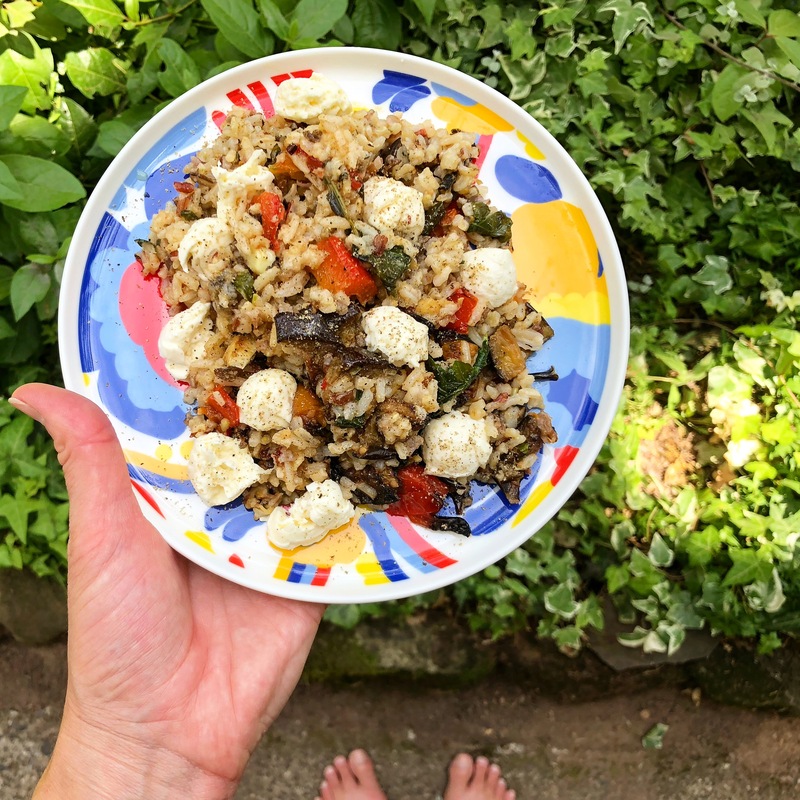 Using up garden vegetables can tax any creative cook this time of year. (I’ve been known to ding-dong-ditch tomatoes with a bribe of our Rose on many a friend’s stoop.) But that has changed since developing this dish and if I can crow for a second? It has become one of my keystone dishes. One that fills family tummies with power packed vegetables, soothing pancetta, and rich rice slow-baked in turkey stock. Perfect leftovers fried up with an egg the next day! Every time, it’s a bit different: Risotto packed with greens, garlic, onions, pancetta, butter, and cheese. Caveat: So I’ve been known to overly fill my Risotto with veggies. So the more (or less), the merrier. Ingredients are listed in order of cooking. Be careful not to brown the garlic — hence it’s addition later. ** This is easy to make vegetarian or vegan too. Kick off your heavier greens now: throw anything you like at this dish! 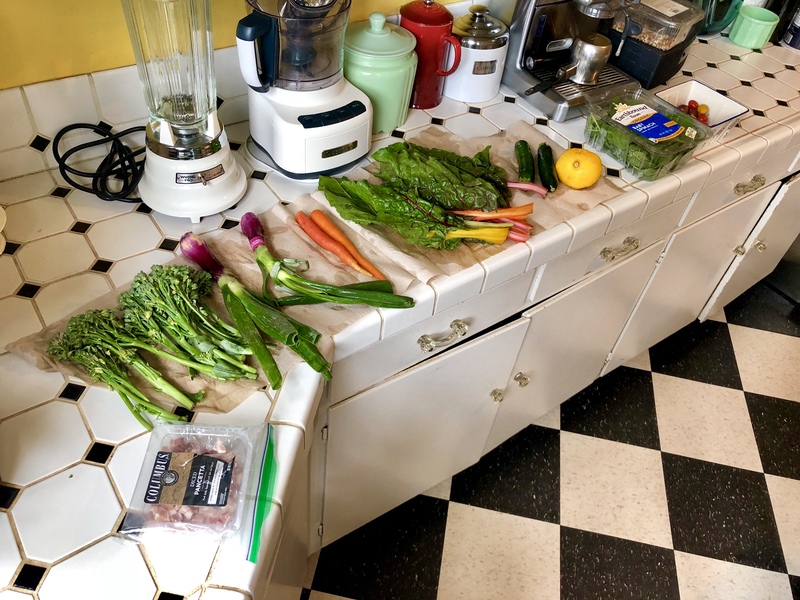 Chopped asparagus, wilting kale (I have a lot of that lately), dregs of spinach leftover, a cluster of broccolini chopped bite sized, etc. Saute, saute, saute! Dashing with stock or white wine when needed. The greens will glow verdant and scrape up any yummy, brown bits. Here, add that 1.5 cups Arborio Rice (#gf), 2-3 course chopped tomatoes (or a handful of cherry tomatoes intact! ), 2-3 springs chopped fresh Rosemary, and my secret? Halved marinated artichoke hearts. Quick “fry” and then pour in the heated stock. 5.) Allow Risotto to return to a full simmer, stir once, cover, and cook in your preheated oven for 30 minutes. 6.) Remove from oven and check “dryness.” Risotto should taste supple but with individual grains of rice intact. 7.) Stir in 2-3 pats butter, bit of salt (if needed), and then 1 cup+ (to taste) Parmesan Reggiano. Cover & let stand 3 minutes. 8.) Serve with dusting of Italian Parsley and fresh cracked pepper. Pair with a gorgeous white or red wine (because it goes beautifully with both) and save all leftovers for fried eggs in the morning. I’m serious: there is no “too much” or “too little” of the amount of vegetables you can throw at this dish! Customize to your whim! These dish could NOT be more versatile. Easy to use up what you have. Easy to freeze. Easy to thaw and re-heat. Easy to fry-up. Kid friendly. Husband friendly. And makes this Mama very, very happy. I’m big on flavor, health, and leftovers… especially as we head into harvest and the holidays. I hope you make one or both of these two dishes. For they are both very special recipes on happy rotation here in the kitchen! Happy eating! And welcome to Fall. This entry was posted in COOKBOOK, ENTREE, Uncategorized by Abigail. Bookmark the permalink.